Involvement: Elisa was elected as Year 12 Mercy Action Leader at Our Lady of Mercy College, Parramatta. At the University of Technology, Sydney, she was a member of the Beyond UTS International Leadership Development Program, which encompassed a short study program on Business in the USA at the University of North Carolina at Charlotte. Currently, Elisa is a proud advocate and member of Toastmasters, the Golden Key International Honour Society and Young ATEC Program. In 2016, she graduated from ATEC’s Emerging Leaders of Inbound Tourism Excellence Program and was nominated as a National Finalist for the Len Taylor Young ATEC Award for Excellence. Elisa received her Bachelor of Business (Tourism Management & Marketing) from the University of Technology, Sydney, Australia and is a passionate ambassador for Australia’s tourism industry. Her proudest achievements to date include her nomination as a National Finalist for the MyTravelResearch.com "Young Tourism Professional Award" and her completion of a half-marathon in support of the Can Too Foundation – a non-profit foundation which transforms lives through fitness and fundraising for cancer research. 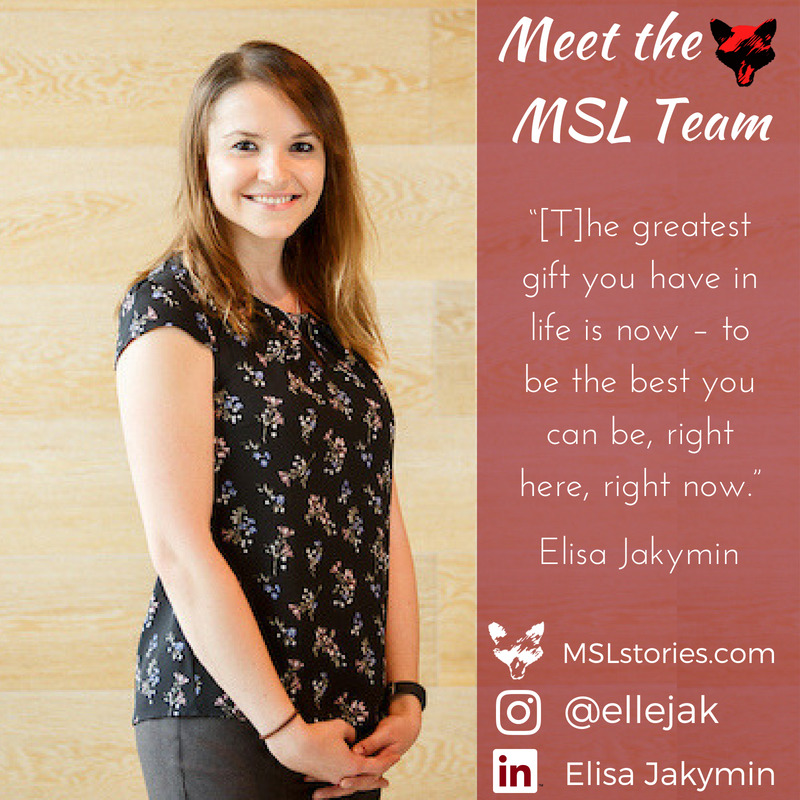 As the Chief Curator at MSL, Elisa leads recruitment efforts for guest bloggers and authors pieces promoting self-awareness and self-improvement as core principles of leadership and life. She is an enthusiastic believer of the notion that life begins at the end of your comfort zone. Three years ago, when we reached out to a Ukrainian-based genealogist to track down our long-lost family, we could never have imagined where the journey would take us. Work/Life Balance - Is it a Myth? Who do you know that works, sleeps and plays for 8 hours, respectively? No one? Me neither. This week, MJ and Elisa team up to tackle the topic of “perfection”. As leaders, we can often get lost in the weeds striving for this ideal, where our desire to be "the best" trumps our drive to simply get the job done. In these cases, fantasy can spoil productivity. Some people are creatures of habit while others thrive on change. I like to think that I lie somewhere in the middle. As important as routine is in maintaining a regular fitness regimen, mixing it up every now and then is important to keep your mind and your body guessing. Ever notice how you feel sore in places you never even noticed before when you try a new sport or workout? Just as our minds get used to and bored with looking at the same thing all the time, our bodies have their own kind of muscle memory. Make #MSL a part of your #FitnessFriday with these insights from Elisa on the importance of having a routine. There’s something about growing up and reaching adulthood that seems to make people less open to risk-taking. It’s almost as if we reach a state of complacency and comfort in establishing our routines that we no longer see the value of trying new things. Whether it’s ordering the same thing at your local restaurant, taking the same class at the gym close to work, or taking a holiday to the same destination year after year – we’re all guilty of it. Love it or hate it – or be defiantly indifferent to it – the #TimesUp movement at last week’s Golden Globes has certainly sparked a conversation. Here at MSL, we are passionate advocates for the importance of sharing stories, the value of finding one’s voice and the resulting impact these actions can have. We are firm believers that our individual stories play a significant role in shaping the broader narrative of our shared society. The New Year is just around the corner, and while it can at times be stressful, it encourages reflection on the year that has elapsed – the good, the bad and the ugly. Travel has an amazing way of expanding our worldview and forcing us to pause, reflect and make changes for the better in our everyday lives. I try to bring something intangible back from each trip I embark on – whether it’s being reminded of the importance of family after reuniting with long-lost relatives in Eastern Europe; becoming inspired after meeting the local businesswomen in a poor village in the Dominican Republic; or, as is the case with my most recent trip to Bali, changing my worldview about things which are beyond my control.